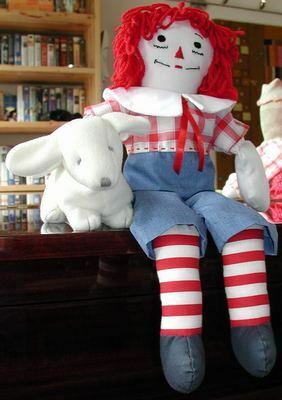 This is an easy-to-make pattern for a 15-inch to 18-inch Raggedy Andy or other boy dolls. For pattern pieces click here. For sewing directions click here. This pattern is my original design and may not be used commercially. - Use contrasting colored cloth for collar, shirt and pants. - Use a velcro dot for the back closure rather than a button. - The outfit can be sewn by machine but the sleeve and leg hems look nicer if sewn by hand. - Top stitching looks nice around the finished waist band. On this outfit I used red 6-strand embroidery floss. - The outfit is made in one piece to put feet in first and pull up. - All pattern pieces include ¼-inch seam allowance. I'd like to suggest that if you spend time making doll clothes, anyway, that you collect a few dolls from friends and neighbors and sew a wardrobe or a complete outfit for each doll. Then donate the doll in the completed outfit to a charity that distributes used dolls and toys to kids that otherwise would not have any. When I was a little girl, nothing brightened up my face more than my mother making me a new outfit for my doll. Other sources to find used dolls to fix up and dress up are yard and garage sales. And lots of churches have annual rummage sales of used clothing and toys, including dolls. Content copyright © 2007 by Susan Kramer. All rights reserved. This content was written by Susan Kramer. If you wish to use this content in any manner, you need written permission. Contact Helen B. Wharton for details. Website copyright © 2007 Minerva WebWorks LLC. All rights reserved.